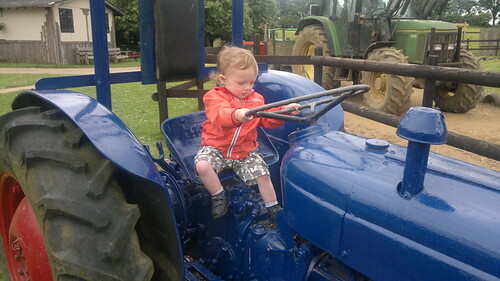 Photo of Dylan behind the wheel in the Dorset Heavy Horse Centre. WE HAVE A four year old boy who enjoys being in the driver's seat. He knows he can switch on all sorts of things that start to blink, beep and wipe when the motor turns over so if he is relegated to the passenger's seat in 13 years time, he won't like the experience. Yet I believe Dylan will face a Driverless World by the time he reaches his sixteenth birthday. I think it will cost more to insure a driver than to insure a driverless car in 2030. I also think the number of cars on the road will start to level off when the Driverless Era arrives. I share these thoughts with creative multimedia students who discount my opinion as too far-fetched for Ireland. Yet I know several rail services in Ireland could operate driverless from today. But it would require a continual investment in signaling and some flexibility from unions. I ENJOY FLIPPING CLASSROOMS and just discovered another way of injecting more activity into classroom lectures. My accidental discovery involves Powerpoint Co-Authoring. 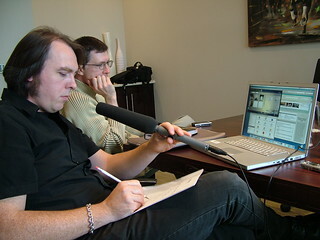 Photo of John Jennings and James Corbett, two virtual education advocates. I DON'T BELIEVE a listing of core technologies exists that helps enhance the academic engagement of third level students. 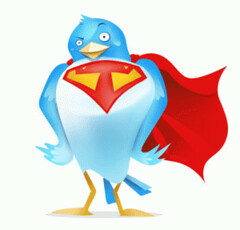 I am creating one of my own and it will borrow thoughts from my instructor pilot days. It occurs to me that my most aspirational students seek to complete assignments and upload them with a flourish on Moodle, our virtual learning environment. For task accomplishment to be most rewarding, my awarding of marks needs to be faster. This occurs when I set a reminder on my calendar to review Moodle "assignments that need grading" and I also want to push that trigger all the way out to my mobile phone screen. In an ideal world, I would see the Moodle logo on my phone's home screen along with a number representing the unmarked assignments awaiting my attention. 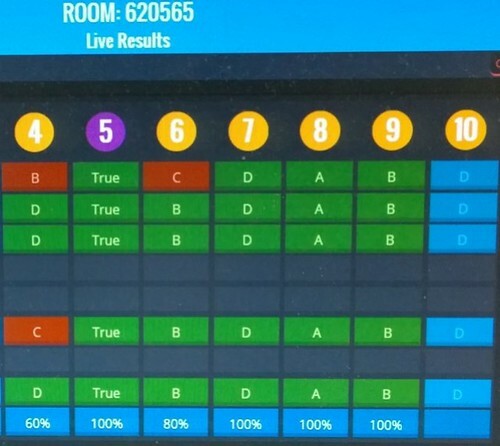 Snap of Socrative beta in classroom use. I STARTED USING Socrative one year ago, got positive feedback from students about its functionality, and decided to use it again throughout the 2014-15 academic term. I believe it enhances student engagement. My initial thoughts about the updated version are below the break. Photo by @topgold at a planning session. AT THE START of every academic term, I try to have more ducks in a row than the previous year. I know I'm better prepared than any previous autumn semester but there are rough edges that need to be smoothed out before our late students arrive at the end of September. AFTER A HALF DAY in Microsoft Ireland, I'm returning to campus with ideas that originated in a Skunkworks project. If my intentions are successful, I will convert that Skunkworks initiative into several clever Windows Phone apps and then watch young children time hop with their grandparents through memories of their school days. I USE TWITTER when teaching Media Writing in the Limerick School of Art and Design because I have discovered real value in watching selected hashtags, in following pathfinders who curate content and in communicating to students via direct messages. I set an essay assignment about "My Personal Evolution with Technology" and know both #edtech and #edchatie support the essay tasking. I know YouTube "hauls" and "unboxing" videos both offer interesting points of departure for writers. We are unpacking "goodfood" with @wholesomeie and viewing the green landscape of #Tipperary through the guidance of Peter Donegan, Ireland's gardening broadcaster. I teach how #context drives perspective, especially in Dystopia. We will listen to #octaver and some of our better essays may end up as part of the #cong14 papers. Photo of Videoscribe tutorial on the Microsoft Surface. 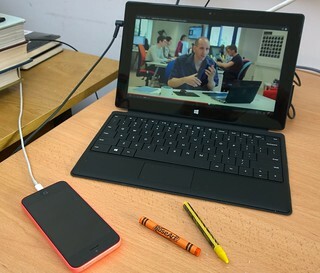 FOR THE NEXT two weeks, I will use a Microsoft Surface computer while learning videoscribing fundamentals. My first impressions suggest it is easier to pinch and zoom flyouts with my fingers and a stylus than with a keyboard and a touchpad. I tried diving into Sparkol's Videoscribe immediately after downloading the Windows program but should have watched at least the first 20 minute tutorial. If I had done that, I would have heard the recommendation to save work locally. I didn't do that before trying to render my work into a second output with an online audio asset--my wifi dropped and Sparkol's videoscribe stopped working. Fortunately, elements of the last project file reappear when starting Sparkol Videoscribe after a crash so I did not lose my work. After 90 minutes on task, I remembered enough to show our six year old daughter how to create an anniversary greeting with her own voice as the backing track. And then we were able to open the same working file at home through the Sparkol iPad app. Snap of Microsoft Surface with Lumia. I GET FULL USE of a Microsoft Surface tablet to see how two of my older styli work when I upskill as a video scribe during the next two weeks. The first two hours spent scribing on Surface have been uneventful. I made a short video clip of my foray into video scribing (below the break) before our six year old daughter demanded equal time with the tablet. She already has favourite Windows Phone games and hoped she would find them as Windows 8 apps. She didn't find her favourites but did enjoy Audible books, Fresh Paint, Monster Island and the Surface's ability to serve her Flash-based games at Friv.com. 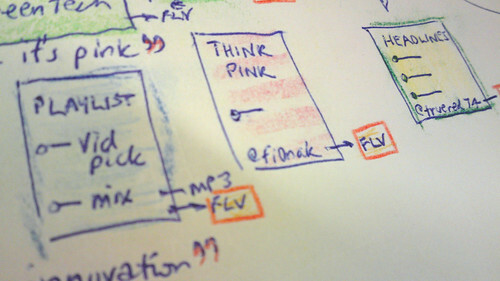 It's going to be fun to train Mia with Sparkol's Videoscribe because she already thinks in terms of timelines and assets.